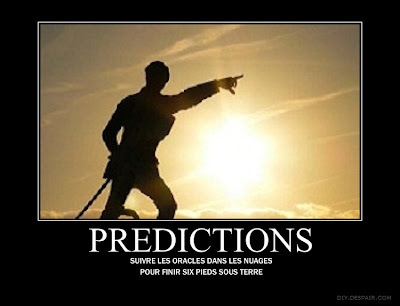 A few weeks ago, I reviewed my "2012 predictions for IBM's Cloud Channel"
Going into 2013, I want to share my thoughts on who in the french Cloud Ecosystem is likely to struggle or to flourish in an ever growing Cloud Tsunami. VARs and Business Integrators: Many Value Added Resellers still hesitate to fully embrace Cloud. They will start feeling the heat of competition from pure-play SaaS Integrators and Cloud Brokers. Deals lost to cloud and SaaS will start skyrocketing. VADs: Value Added Distributors advertise their brand new cloud services aggregation platforms ("ArrowSphere", "StreamOne"...). But channel adoption will take off slower than planned. Reasons range from Vendors' inability to seamlessly integrate their cloud services with the platforms to VADs' own transformation to cloud (issues with compensation, priority still given to short term capex transactions, etc...). Moreover, VADs are not yet perceived by many integrators and vendors as necessary, credible and skilled for cloud services distribution. ISVs: Traditional Independent Software Vendors are now overwhelmed with strategic alternatives when it comes to Cloud. They have too many possibilities to cloud-enable their existing applications (leveraging IaaS or PaaS offerings) or to develop cloud native solutions. They must also decide how and how fast to integrate mobility, big data, social, etc...Wow! MSPs: Managed Service Providers have a hard time deciding whether to compete on IaaS/PaaS commodity with the likes of AWS, MS Azure, IBM SmartCloud, CloudWatt, Numergy, OBS, OVH and others or to carve their specific high added value vertical or community niche. Many MSPs with Cloud Canada Dry offerings will struggle to deliver the level of profit they need to surf, let alone stay afloat in the tsunami. As for Telcos, I have no clear vision regarding their ability to win or loose as cloud providers in 2013. Large established IT Vendors: Big technology and/or service providers run for the cloud gold since a couple of years now. But their KPIs, processes and reporting mechanisms still have to adapt to the changing rules of the game. Add the difficulty they face to ramp up skills and culture and to change behavior and leadership and you see why cloud's acceleration is definitely not a walk in the park for large incumbent vendors. Cloud Builders: Infrastructure integrators and Cloud Builders build business plans for private/hybrid cloud design and implementation. But they struggle to retain and to attract the cloud talents that they need to stand out from the crowd and be positioned as experts in this field. Besides, many of them don't find it easy to move some of their offerings from capex (buy your cloud infrastructure) to opex (I will let you pay as you grow/use). BPaaS and "Vertical Channels": All sorts of content/data providers, business service providers, business process outsourcers benefit from PaaS and SaaS solutions and become providers of BPaaS (Business Process as a Service). Depicted as "vertical channels" by some cloud ecosystem analysts, they are now seen as meaningful channel and solution partners by SaaS vendors who are struggling to get traditional VARs and IT integrators on the cloud bandwagon. Some will even turn their vertical consulting/data/business practice into software that to be delivered "as a service" on the cloud. B2B AppStores: This prediction is a bit too early, at least here in France. There still might be some early winners in the scope of B2B Cloud Services Aggregation, Brokerage, Marketplaces, Vertical Communities, AppStores... A lot of different actors want to play, ranging far beyond VADs, Telcos, B2B retailers and large vendors. Let's keep an eye on this throughout 2013! Born on the Cloud ISVs: SaaS Startups begin invading the french market. They will force their traditional counterparts to adapt quickly, treat SaaS seriously, acquire some of those cloud natives or die. Both well funded and bootstrapped startups will benefit from the IaaS/PaaS wars to leverage true pay as you grow cloud platforms for their SaaS applications. By generating leads through inbound/social marketing, they will challenge established vendors even more. Business minded IT Departments: More CIOs will morph their IT shops into Cloud Brokers to closely align with LOBs [Lines of Business]. They will provision and integrate IaaS/PaaS/SaaS/XaaS resources through a carefully selected (compliance...) and negociated (SLAs...) catalog of cloud services which will encompass both private, managed private, hosted private, and public cloud services. With a similar approach, forward looking VARs of the "trusted advisor" type will play a similar role for those SMB customers who outsource the CIO function to them. Cloud Experts: Skills shortage, both in technical and sales arenas, will benefit those who took the early cloud train. Cloud Architects, Cloud Implementers, Cloud Pre-Sales, Cloud Rainmakers... will be chased and lured by providers of all types. What an interesting time for Cloud SMEs (subject matter experts). Hey, if you are one of them, consider joining us and writing, in french, for the new Thoughts on Cloud - Français! 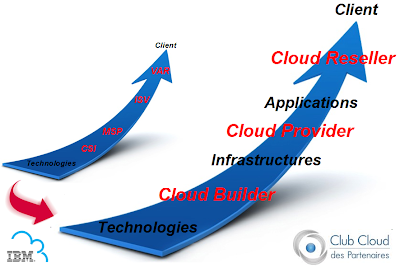 What are YOUR predictions for the Cloud Ecosystem in 2013?